Today’s textbook market is more competitive. College stores now competes with thousands of online sellers, from Amazon to individual sellers. This gives the student shopper hundreds — if not thousands — of options for acquiring their course materials, as well as the means to easily compare prices. One way for stores to compete is by augmenting their traditionally-obtained inventory with sourcing through the marketplace. To learn more about how new avenues of sourcing can benefit your store, check out this Q&A from President of MBS Textbook Exchange LLC David Henderson. Q: Why do college stores want a sourcing option? To be truly competitive, the college store must have wider access to lower or deal-priced textbooks to expand their used textbook and rental programs. Q: How do most stores currently source, outside of wholesalers and publishers? Some simply do it by shopping the marketplace one copy at a time, while others use third party tools to help with exploring what’s available. Both options can require a great deal of time and energy. In addition, few — if any — are truly integrated to the store’s retail management system, creating inefficiencies and often inventory management issues. Q: What are some other challenges stores may face when attempting to source alone? While sourcing on their own, they have to make credit card purchases of marketplace product, and then deal with multiple single-copy shipments in their receiving area. And with little or no integration to the store’s retail management system, reconciliation of receipts, invoices and credit card statements is both time-consuming and error-prone. Q: How can MBS help? The MBS Sourcing Service will couple technology with logistical support to scale the ability and ease of process for stores to simultaneously source both marketplace and traditionally-priced used textbooks. Q: What will set this service apart from other sourcing options? First, it is important to realize that marketplace sourcing comes with risk as marketplace-priced product is non-returnable. No two stores are exactly alike, as each will have their own demand for this risk-based product. As such, it is imperative that the sourcing tool college stores employ has the ability to simultaneously secure marketplace-priced and used product with traditional return privileges, with the store in complete control of the title and quantity search. The MBS Sourcing Service will do just that. 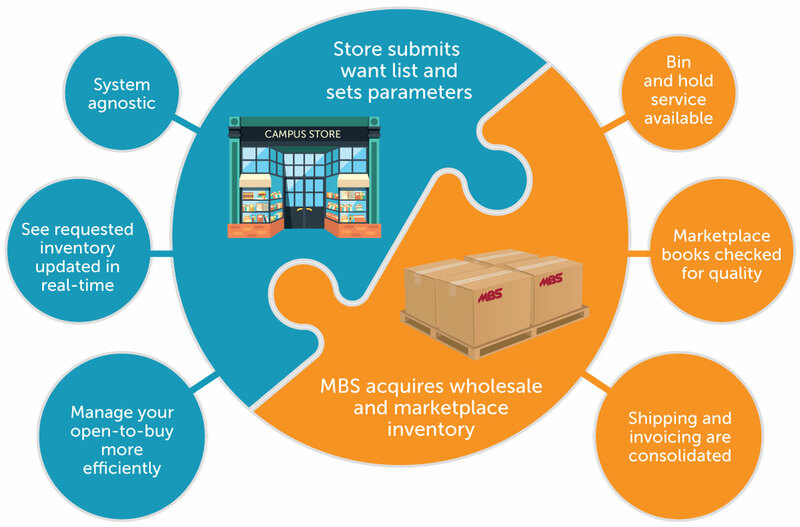 Second, it is important to note that the MBS Sourcing Service is “system agnostic.” Because it won’t require that the store be an MBS Systems user, this service will be available to all college stores. There is no investment or maintenance of equipment required on the part of the store, and there are no annual or transactional fees. Third, remember that the college store still holds an incredible competitive edge in today’s market. No other textbook seller can offer the level of convenience and service to students that the local campus store can. The MBS Sourcing Service will be a complementary tool to the mission of these college stores. Finally, as MBS is the leading wholesaler of new and used textbooks in North America, with a decades-long history of bringing innovative technology solutions to the college store industry, no other company is positioned to scale sourcing to the level college stores require to expand their competitive position in today’s textbook market than is MBS. When the store submits their want list, it will immediately populate their own cloud-based dashboard. Then they will be able to easily search marketplace-priced product as well as traditionally-priced product at the same time. The store’s personal dashboard will also be constantly updated with inventory that is available to them at prices below Publisher Net pricing, which will help to maximize their used book offering. Q: How do stores sign up? As we get closer to the launch date, MBS will outline the simple process for signing up. There will also be online educational programs and self-paced tutorials available for the stores, as well as a toll-free helpline to assist stores as they use the service.